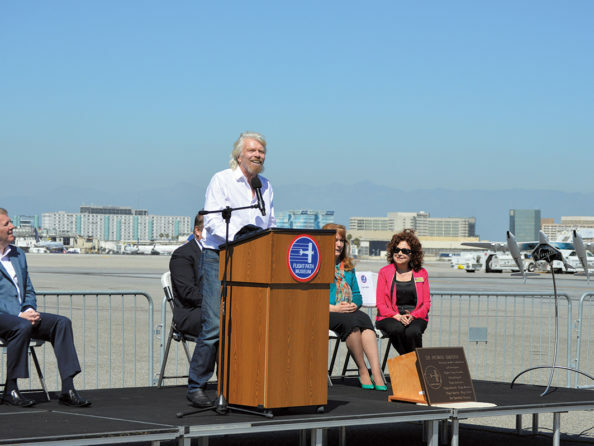 Sir Richard Branson is the newest member of the Flight Path Aviation Walk of Fame after being inducted on Wednesday, March 28 at a ceremony at the Westchester museum. An entrepreneur and philanthropist, Branson has had a role in creating or managing more than 400 businesses, including Virgin Atlantic, Virgin Australia and Virgin American airlines. Branson, 67, is the 54th inductee in the Aviation Walk of Fame, which was created in 1995. Bronze plaques featuring heroes of aviation line Sepulveda Blvd. in Westchester. Branson’s plaque will be located on the corner of Sepulveda Blvd. and Westchester Parkway, in front of the Paradise Building, when it is installed later this month. Other distinguished inductees include the first man to break the sound barrier, retired Air Force Brig. Gen. Chuck Yeager; entrepreneur, pilot and airline founder Howard Hughes; Apollo 12 astronaut Pete Conrad; Orville and Wilbur Wright; Charles Lindbergh and Amelia Earhart. LAX is the only airport in the world served by the three Virgin airlines. Branson’s latest endeavor is Virgin Galactic and Virgin Orbit, which is developing the orbital launch vehicle LauncherOne. Pictured: Sir Richard Branson addresses the crowd at his Flight Path Aviation Walk of Fame induction ceremony on the LAX tarmac.